Last edited by Isildilmë on Fri Dec 16, 2011 5:41 am, edited 1 time in total. Last edited by Isildilmë on Fri Dec 16, 2011 5:42 am, edited 1 time in total. Hey Isildilmë! Remember me? "It does not do to dwell on dreams and forget to live." I'm back and I got my tatt done! I'm not sure how to post a pic on this forum so maybe I could email you instead? Let me know how! Nice, I can't wait to see that ! And sure, you can email me ! I'll post it here for you after (I use photobucket.com to upload the pictures). There is always the button "email" at the end of my posts, but I think you cannot send files this way, so write me directly at isildilme@hotmail.com. Natina22, si lo haré, pero no creo que podré ponerlo aqui antes de lunes. Haha, there's no rush! Thank you again so much! I hope you like it I do. Haha, true but it really would be the icing on the cake if you liked it too! I don't want to spam the forum lol, but do let me know! Stephaniet18 wrote: I don't want to spam the forum lol, but do let me know! Haha all right You've done literally thousands of transcriptions, which one was your favorite? Yeah... actually more than 2150 transcriptions for here... I first thought I would just give a hand while there was nobody regularly here... but after almost 2 years I became linked to it ! My favorite ! What a hard question... I loved to do many of them, in fact all of them, but more when the sentences as a special meaning, or if the person tells me the meaning it as for him/her, so it gives the whole thing a personnal and "real" dimension... 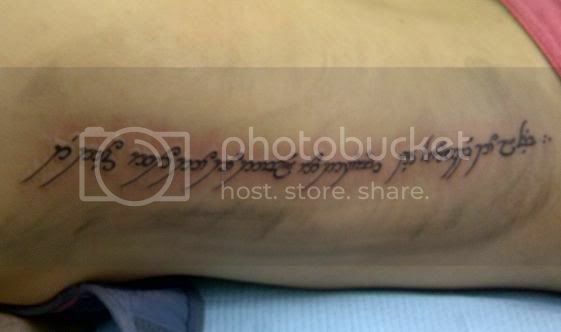 I like to do long and beautiful poems, and Tolkien quotes, and over all I have a preference for Quenya phrases as I have a fascination for this language... And of course, I'd say that I enjoyed working on the transcription for my own tattoo... which is logical ! 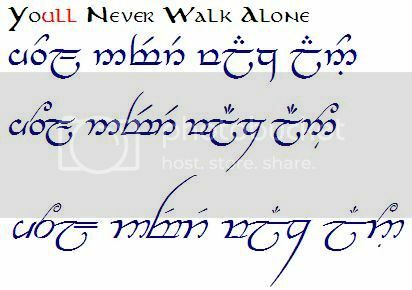 It was in Quenya, composed by me refering to a passage in the Silmarillion (with a little help in the Quenya thread just to correct my translation), and then transcribed by me. It's one of the first serious transcription I made, and after I worked on the script to embellish it... when you put yourself in something, and give it an emotionnal dimension, it becomes very special ! As a kid I had my whole life planned out; but didn't we all? Then I grew older, real life hit and the plan is still just a pipe dream. Went through a rough patch a few months ago, with all the stress of university applications and exams, and then I came across the quote in Harry Potter. Seems fitting I would get it done in Elvish seeing my absolute two favorite series as a kid was LOTR and HP I must admit I have been toying with the idea of a tattoo for over a year before though! Oh, and I'd love to see your tattoo if you don't mind! Here's a picture of the tattoo I've designed using translations you've done for others in past posts. Thanks again, i'll post up pictures once the tattoo's are complete! . As you can see, the rest is exactly the same ! Stephaniet18, thanks for sharing ! This makes so much sense, and it links two things you loved (and will surely continue to love, why not ?!) with you life and will also serve to remember you what is important... a very good project ! Btw I LOVED also both series (for LOTR I think you could guess it... ! ), that I read often, and in many languages. I finally accessed my email ! And my comment, as you asked for it : I love it, the writing seems very well done (which is not the case for all tattoo artists), and it's very feminine. But with this picture it's not easy to really see how it's placed on you... What I see is that it seems to be from the armpit to the hip, but placed a little more on your back, not exactly on the side, and this place makes it even more feminine, good choice. What this picture taken right after the tattoo ? I guess yes : we all have difficulty to wait until we remove the blood and ink of our skin, we need a picture NOW ! haha ! If you ever feel like sending another picture where it's cleaner and where we see more obviously how it's placed, I'll replace it in my collection, which I also post on my facebook account, except if you prefer I don't. Isildilmë you are wonderful! I love your tattoo too, and the story behind it! The new transcription you just did for me looks amazing, so now I'm all inspired and am going to go work on it, along with our sons name, to design my tattoo! woot! The story behind the "love, laughter and loud noises" is that when we were preparing for our wedding, we found a local place that makes custom titanium wedding rings. Part of the price of them included engraving the inside of it with a word/phrase. We thought about it for a long time, and "love and laughter" kept coming up, but it needed to be a third "L". We were being idiots one day, wrestling and just yelling and having fun when I did the classic scene from the movie "anchorman" and I yelled "LOUD NOISES", to which we both immediately decided needed to be the third "L" word in our rings (cos we're idiots, and tend to make loud noises for the fun of it) and so we have "Love, laughter and loud noises"! haha. I love the phrase, it's become very much "us", and now I have it transcribed, it is a way to honour our marriage without making the potential mistake of actually tattooing his name on me! Thank you, you really are amazing doing these! And so many others!!! And for no better reason than you're awesome. hehe. Now, a huge big merry christmas to you! 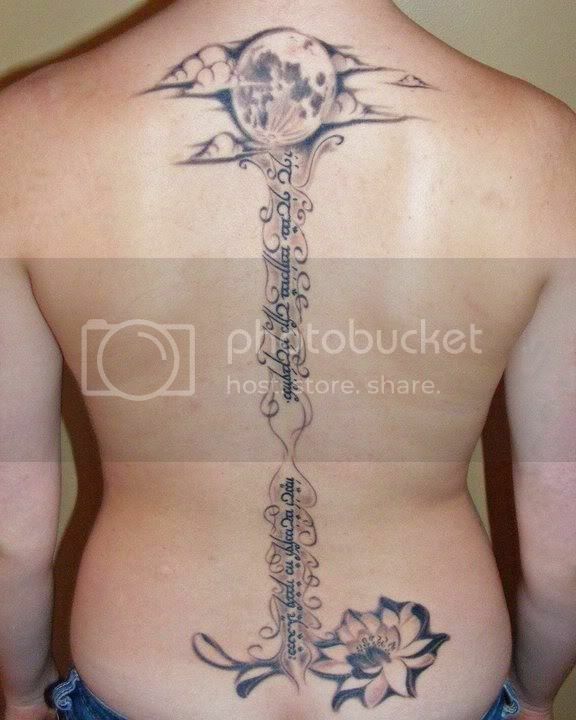 I WILL come back with my design and with my final tattoo; I promise! Stephaniet18, you guessed right, I worked a lot on it before I felt ready to get to the "forever" step ! I think that preparation and patience is the better way to be sure that you'll love the result forever, and that it is not something that will pass and that you'll get bored of. I realised that my love for Tolkien's world, elves, languages and script was just increasing with years in the last decade, as well as my fascination for the full moon, and the elvish story behind it... I always feel this spiritual atmosphere, nostalgic, a bit sad but so beautiful and mysterious... you should see me watching full moon every month ! A real child, I tell you ! 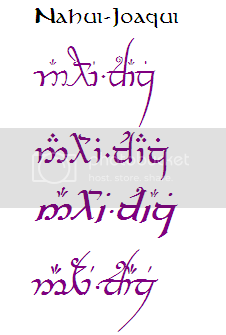 All the contrairy of some people that get here and tell me : "Just discovered this thread, never thought it was possible to write whatever we want in Elvish writing ! 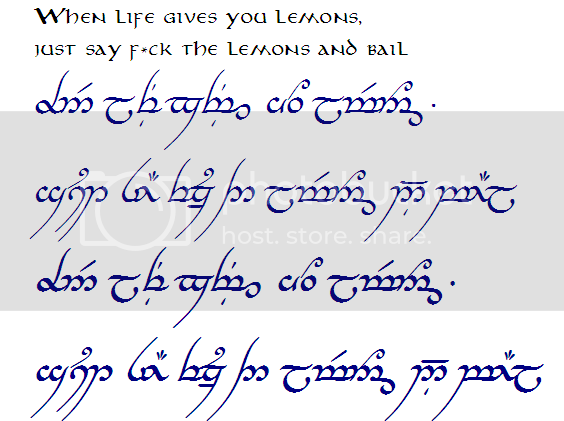 I'd like to have [...] in Elvish, and please ASAP for my tattoo is in 1 week." First, they don't take any time to think : do I really want this script ? What do I know about it ? Does it fit with me or is it just because the movies are still "hot" and in vogue ? Will I like it in 10 years or will I feel stupid because this script is imaginary, the movies are not in vogue anymore and I wont have any other reasons to recall except "I thought it was beautiful"... Second, but that worth for everyone, they don't know me... I'm always a bit surprise when I realise how many people just take what I give them, believe me, often don't even try to understand how it was done, just to check if it makes sense or if I just hit keys randomly before posting gibberish, and get it inked ! Of course, I don't do that, I take all of this very seriously, and I do the transcriptions as accurate as my knowledge on the subject can permit me to, but you see what I mean ! I wouldn't be that confident with a stranger on the net ! Actually some people also double check, I have the proof when some of them ask me questions on why I used this symbol instead of that other one, etc.... but I think it's a minority of cases. 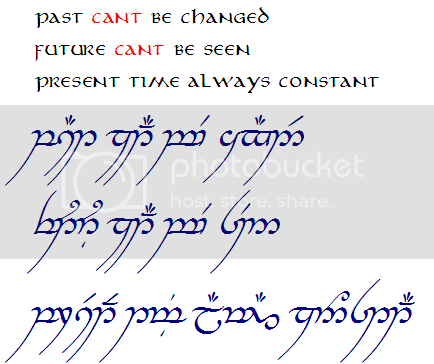 Help me translate this Sindarin name into Tengwar? The word is Melethiel. It is my name in Sindarin. By the way, i guess that before Christmas i'll get the tattoos and post the photos here. A great hug and once again thank you for the amazing job. I'm glad you enjoy it !